This morning I awoke early to participate in a Community Service project for The Cleveland Photographic Society www.clevelandphoto.org . We were shooting participants representing the Organization for Autism Research and the Leukemia and Lymphoma Society who were running in the Cleveland Rite Aid Marathon. Thousands and thousands of runners took part. 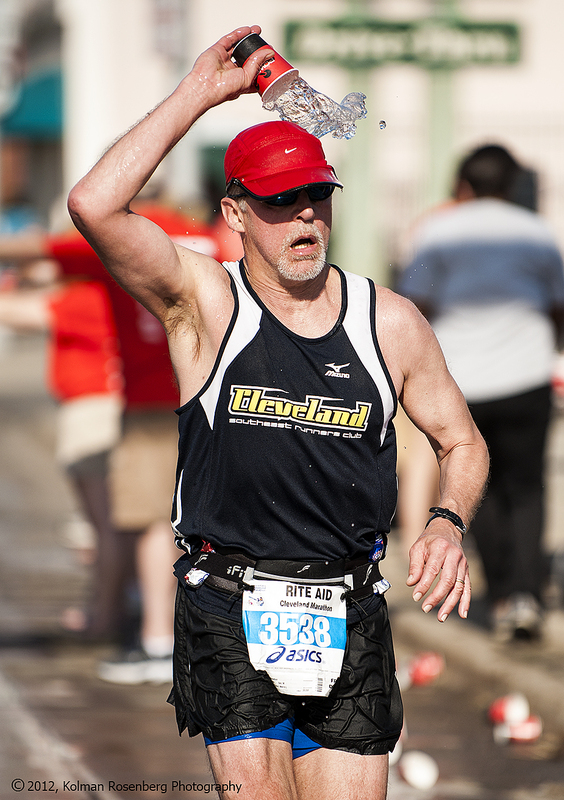 After shooting the runners shortly after the start, as they approached the top of the Cleveland Shoreway bridge over the Cuyahoga River, I moved to another location, somewhere around the 14 mile point in the race at a refreshment station. 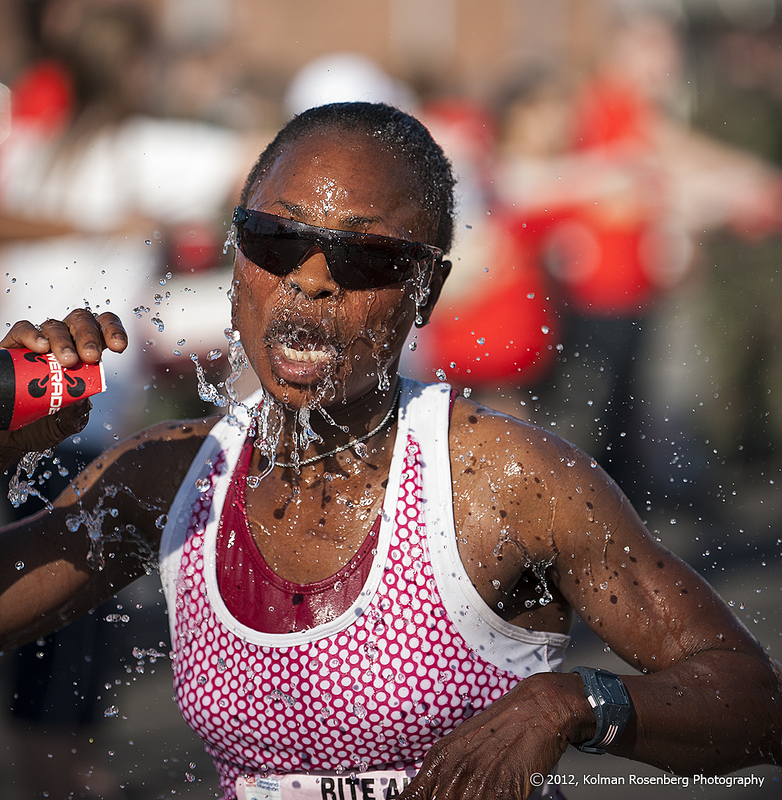 While still trying to pick out and photograph runners from the two organizations, I was also shooting interesting looking runners as they drank and showered themselves with water. While it was still fairly early in the morning, the sun was bright and the temperature was rising! After seeing this first photo I decided to make an effort to capture more like it, with water frozen in time being splashed on faces, heads and backs, in an effort to cool themselves down. These two photos were my favorites, capturing the spilling and splashing water at high shutter speeds and recording slices of time! This entry was posted in Uncategorized and tagged Autism, Bridge, Cleveland, cleveland photographic society, Frozen, Leukemia, Leukemia and Lymphoma Society, Lymphoma, marathon, OAR, OH, ohio, Organization for Autism Research, refreshment, Rite Aid, Shoreway, shutter speed, slice, spilling, splashing, time, water. Bookmark the permalink. Nice capture, Kolman. Are you going to shoot the marathon again this year? Thanks Bob! This was today! Tough getting up at 4:30, leaving the house at 5:00 to get down there before the roads were closed! Especially after last night’s festivities! Awesome marathon shots! I just love how you stopped action but still showed so much action. Mom & I were running the 10K yesterday. Great photos! Mom & I ran the 10K part of this yesterday. Great photos! Sorry i didn’t see the two of you! But then again, there were only 20+ thousand people going over the shoreway bridge! Hope you had a good run!